Hughes 9202 terminal, Pelican Case, AC power cable and international adapters, cat5 cable, battery. This unit has multiple user support allowing your entire team to share a single 9202 simultaneously via WiFi, providing your entire site with a broadband local area network. The Hughes 9202 is a fully IP-compatible terminal certified for operation on Inmarsat’s BGAN global communications service. Rugged and easy to use, the 9202 enables simultaneous IP packet and circuit-switched data communications via standard Ethernet, ISDN, and 802.11 WLAN interfaces. Easy to set up and connect, the Hughes 9202 is built to operate in even extreme weather conditions. Multiple user support means an entire team can share a single 9202 simultaneously, providing an 802.11 broadband wireless LAN at any site. Compact and lightweight, the Hughes 9202 can be quickly moved from site to site and connects within minutes. 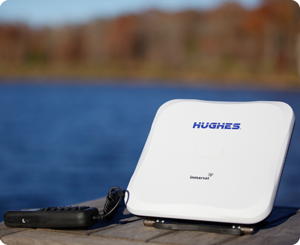 Combined with the global coverage of Inmarsat’s BGAN service, the Hughes 9202 offers a powerful IP-compatible gateway for corporate teams to stay connected and to share critical information virtually anywhere, anytime.